In April, we offered you Facebook cover photos and customizable posters that were designed with popular student trends in mind. This month, we're expanding on that with even more options and specific themes to target freshmen and faculty as well as help you advertise during rush! Take a look at our 11 new designs below and add them to your Facebook page, today! Your store has lots of advantages over online retailers; make sure students understand all of them with these fun advertising options! Just click each link to download the theme. 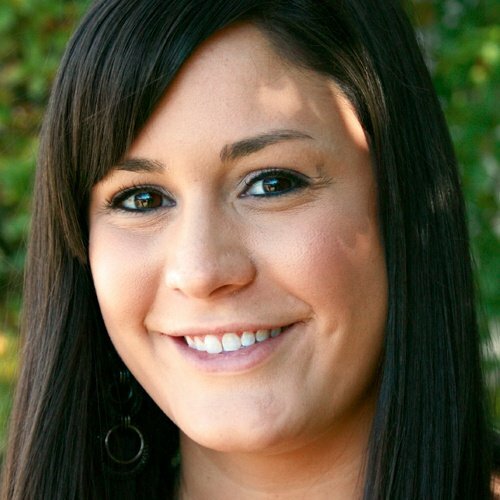 You know you have competitive prices, but your students may not. 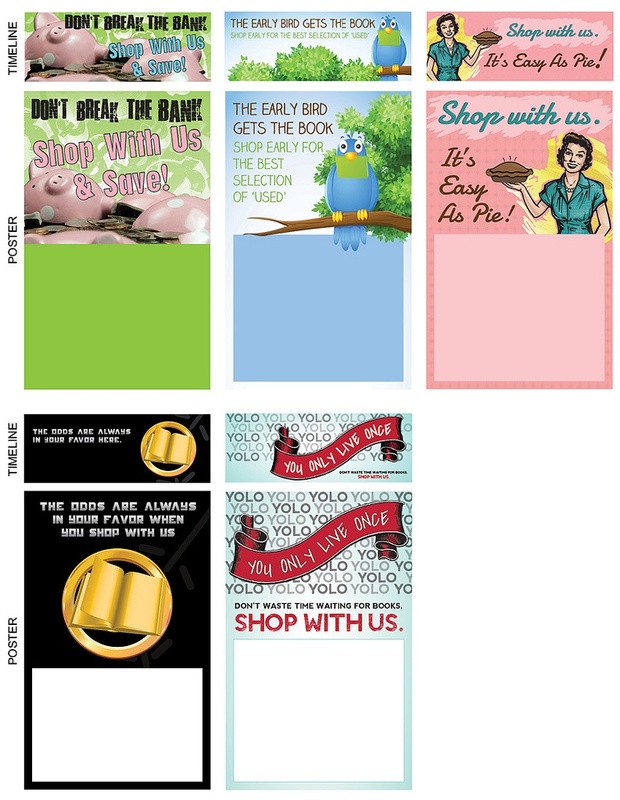 Encourage them to compare you to online retailers before buying with this theme. Remind students why it's so important to shop early with this option. No shipping, no waiting, no hassle! Your store's convenient location on campus is one of its biggest selling points; don't let students forget that fact with this retro theme. Between the movie and the books, Hunger Games has been a huge hit with students. Appeal to their inner 'Mockingjay' with this fun option that even Effie would approve of! Forget Carpe Diem; this new catchphrase, which stands for You Only Live Once, is quickly becoming college students' new motto. Show them you're up on the latest trends with this amusing theme. Establish loyalty with the incoming class by educating them on the benefits of shopping on campus. You'll notice that the 'Right Foot' theme promotes the hashtag, #FirstYear. Get acquainted with new students by encouraging them to use this hashtag to share what they're most looking forward to during their first week or how their first day of classes went on Twitter. You can even reward your favorite responses to enhance loyalty even further! This interaction will get them accustomed to interacting with your store's social media pages from the start. From college students to NBA players, Nerd Glasses are undoubtedly the newest trend. 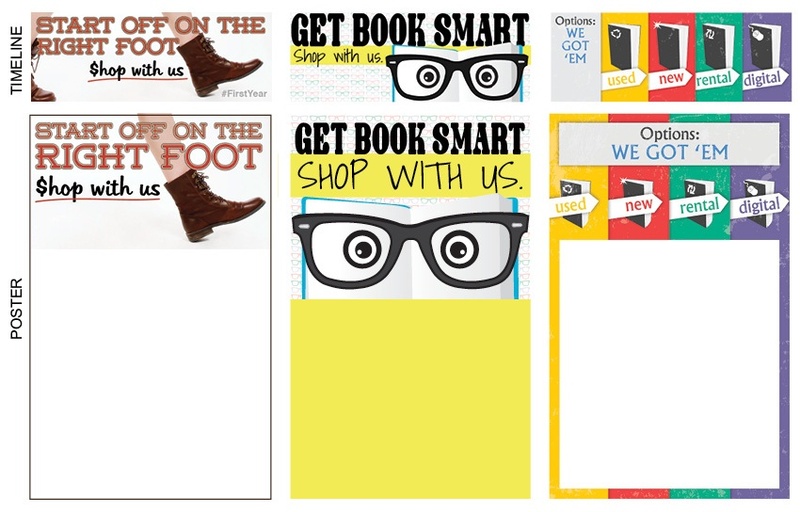 Show students you're just as happening as the next hipster with this fun theme! They want em', you got 'em! Educate new students on the fact that you have all the textbooks they'll need to start the semester with this colorful theme! On-time adoptions are essential to your success. Encourage faculty to submit them as soon as possible with these themes. 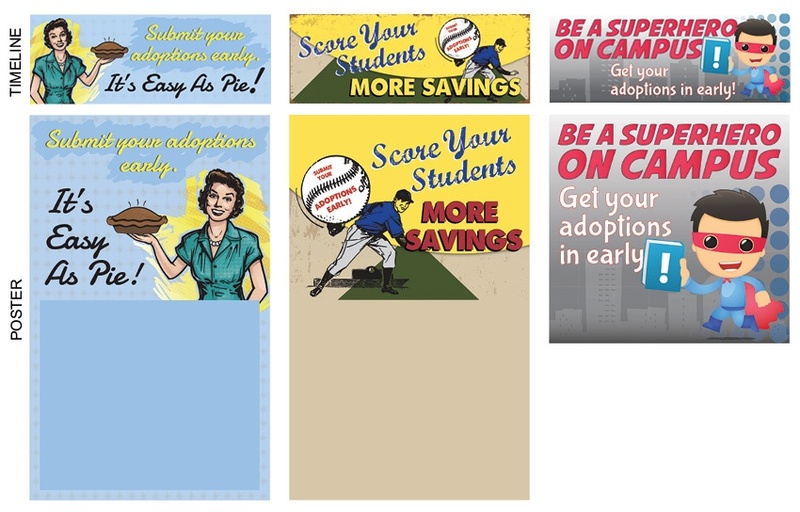 Show faculty how convenient your adoption submission process is with this retro theme. Reinforce the significant impact that early adoptions have on students' buyback values with this baseball-themed option. Remind faculty that early adoptions can save the day for both students and your store!